Let's make this years holiday party the best one ever!!! Sound Express Entertainment Group loves creating memorable events, and this year we want to be a part of yours. For our standard holiday party package, we send out a DJ & MC combo that will interact with your guests during dinner and hypes it up during dancing. People will be having fun before the dance floor is even open! 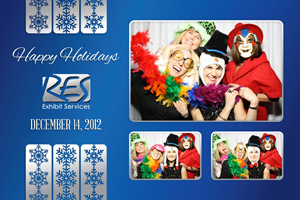 Our photo booths make for a really fun add-on. The templates are fully customizable to your event colors or theme, as well as personalizing it by incorporating your photo or company logo on it. Check out some of our examples below. Pretty awesome, huh?